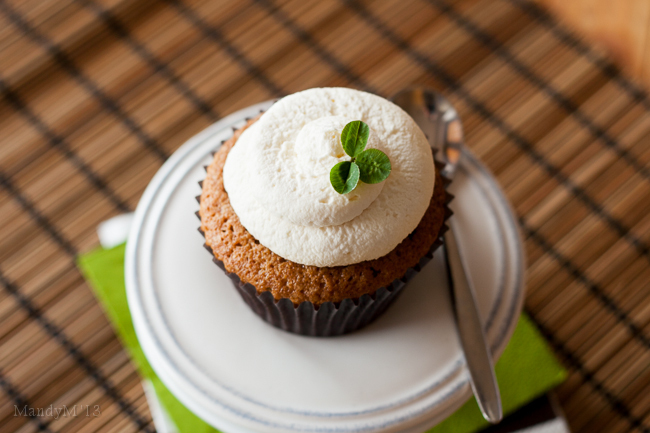 Irish Coffee Cupcakes — What the Fruitcake?! Without a doubt, St Patrick's is the biggest social event of the Irish year. Everyone looks forward to the bank holiday, whether it's because it means a work free day (yay!) or plans for heading into town with friends and having a good time, starting on the eve of and then throughout Paddy's day. Apart from the influx of tourists, and it wouldn't surprise me if the total amount of tourists totalled more on St Patrick's day than it does for the whole of Summer, it's pretty cool being in Dublin for Paddy's day. Huge ferris wheels and other funfair rides are assembled on cordoned off streets. Cheesy green and clover laden hats, t-shirts, sunglasses and other "festive" knick knacks appear for sale in most large stores, even those outside of the tourist zone. Hubby makes me jealous when he tells me he's having one of my favourite giant hotdogs from the street vendors that pop up for festivals. It's just a great time in Dublin. I also think it also helps usher in Summer. Days are getting longer, the daffodils are blooming, and no matter what the weather on either side, it always seems to be dry, and sometimes even sunny on Paddy's day. God loves the Irish and wants us to enjoy the day! With this year's St Patrick's day falling on the weekend, we have the added bonus of getting the Monday as a bank holiday instead. So to celebrate the Irish and my adopted country, I thought some cupcakes were in order. Now, I know that cupcakes are no longer the trendy food to make. The foodie world's moved on to cake pops or quinoa or hay or something green and exotic by now, but I still love cupcakes. They're easy to make, are perfect for sharing with friends (or very eager co-workers!) and lend themselves perfectly to being adapted to suit whatever theme you're going for. In this case, something suitably Irish. Coffee. Cream. Jameson. Thank you for adding booze to coffee! Just what we need with our caffeine kick, a healthy dose of alcohol to further warm our toes while we pretend it's warm enough for open toed shoes. Not quite as potent in cupcake form, but who cares. It's a cupcake. With coffee. Cream. And Jameson! 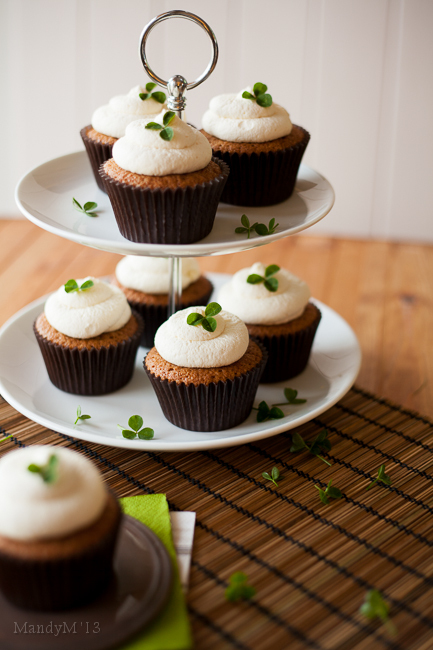 Posted on March 12, 2013 by Mandy Mortimer and filed under Baked, Sweet and tagged Bakes Coffee Cream Cupcake Irish Coffee Paddy's Day St Patrick Sweet Whiskey.